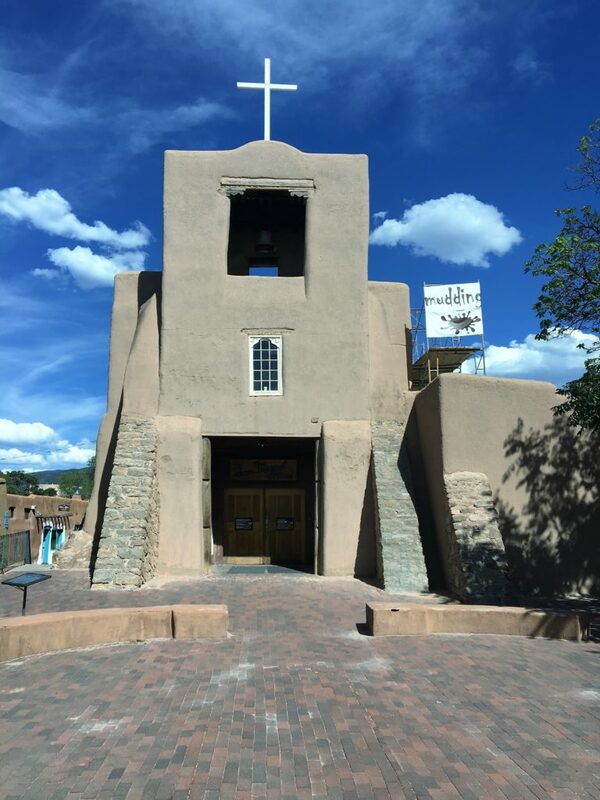 Santa Fe – something old, something new, you have to try try green chile stew – Live MoHo! 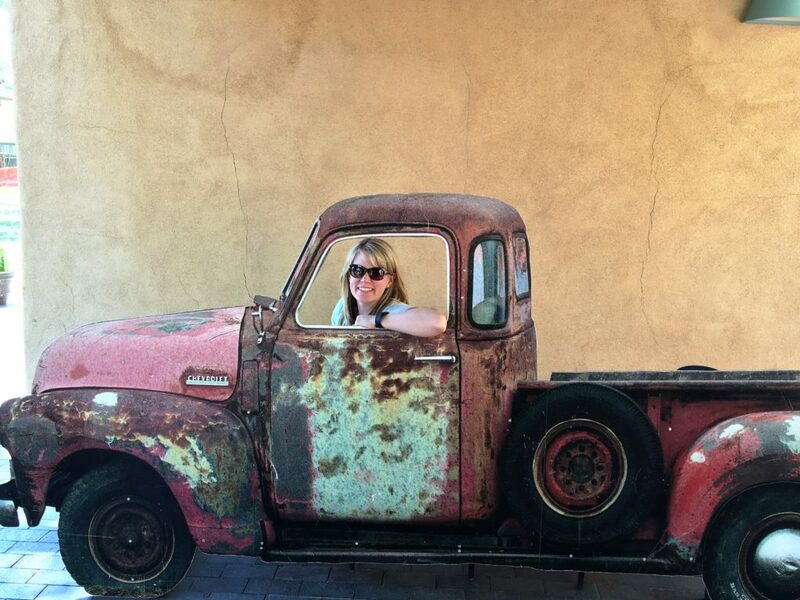 Santa Fe New Mexico is one of those places you really just have to see. It is – especially by North American standards – OLD. The pueblo tribes settled the area more than a thousand years ago and the Spanish founded the current town in 1610. At the same time in Europe Louis the 14th was crowed king of France, Henry Hudson first entered the bay in present-day Canada which bears his name, and the Dutch colonists were set to make their first landing on the island of Manhattan. You might think that the oldest church in America is in Boston or Philidelphia or even Charleston. But it isn’t. It is actually in Santa Fe. 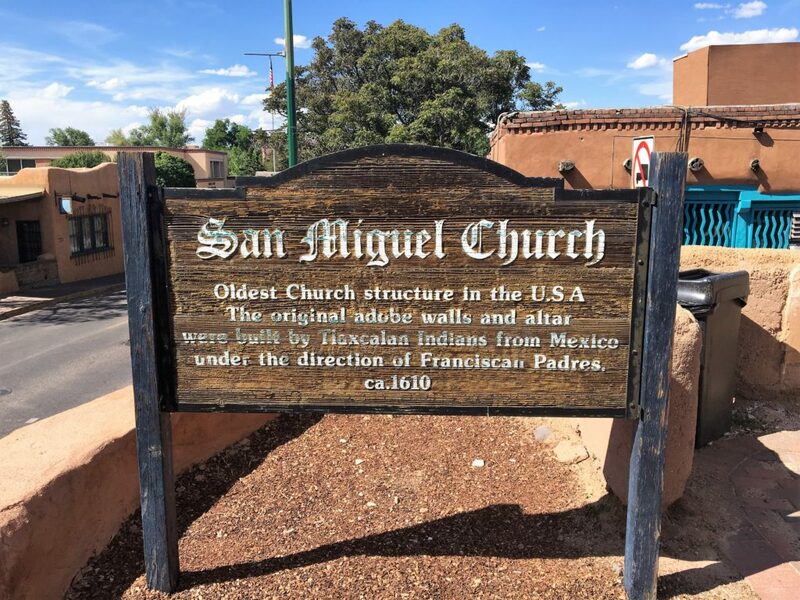 The San Miguel church was built in 1610 and while it has been remodeled and added on – the belltower was added 150 years later in the 1700s – the original adobe walls and altar are still standing. The church was closed when we visited but it apparently retains its humble roots inside. We spoke to a tradesman who works for the National Park Service who was visiting with his family. He told us he is part of the crew that is recovering the adobe exterior with mud stucco that is made from mud and clay from the same location as the original church! It is impressive that the Park Service keeps this level of authenticity. This church is in the oldest part of Santa Fe and the entire area is extremely photogenic and fun to walk around. Most of the buildings here were already 150 years old when Paul Revere and George Washington were ready to fight the British for independence. 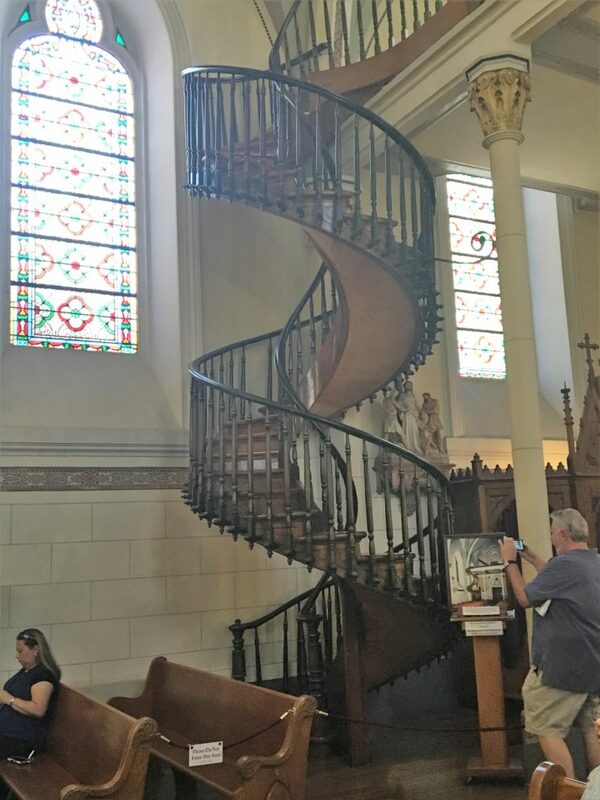 Another interesting church is the Loretto Chapel, most famous for its “miraculous” staircase. It seems the chapel was built without any stairs to the choir loft. That kind of design was fairly common at the time as the choir was typically composed of choir boys who would climb a (very) tall ladder to reach the choir loft. 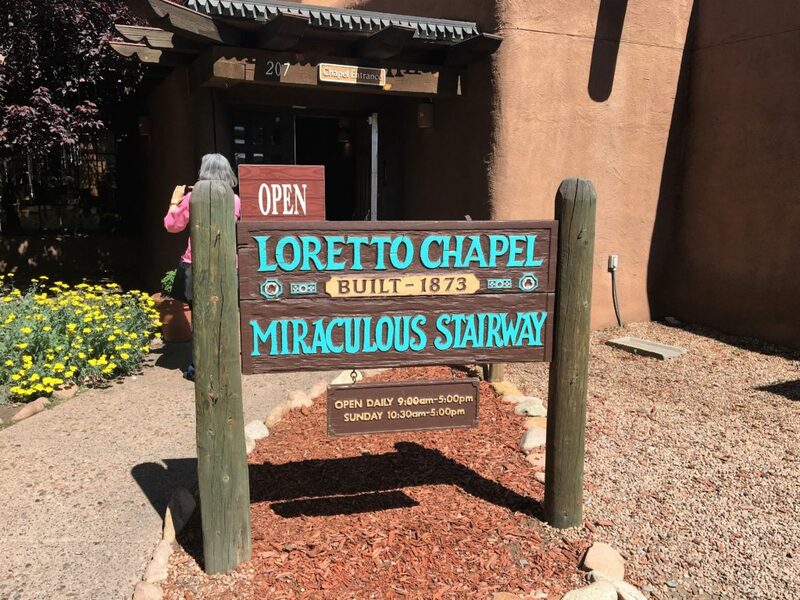 The Loretto chapel was, however, intended to house the Nuns of Loretto and the nuns were not very excited about climbing a ladder to reach the loft some 30 feet above the floor of the chapel. A month after the nuns moved in, they knew something had to be done. The chapel is small and there was simply no room to build a staircase. Ladders would not work. Frustrated, they prayed to St. Joseph – the patron saint of carpenters – for an answer. For 9 straight days they prayed. On the 9th day, a shabby stranger appeared and promised to solve their problem. He demanded total privacy and for 3 months he locked himself in the chapel with only hand tools including a saw, a hammer, a carpenter’s square, and buckets of water. When he emerged, he revealed a stunning double spiral staircase built without any central or side support. When the nuns tried to pay him, or even get his name, he vanished. Many say it was St. Joseph himself who appeared and built the stairs, making them miraculous. 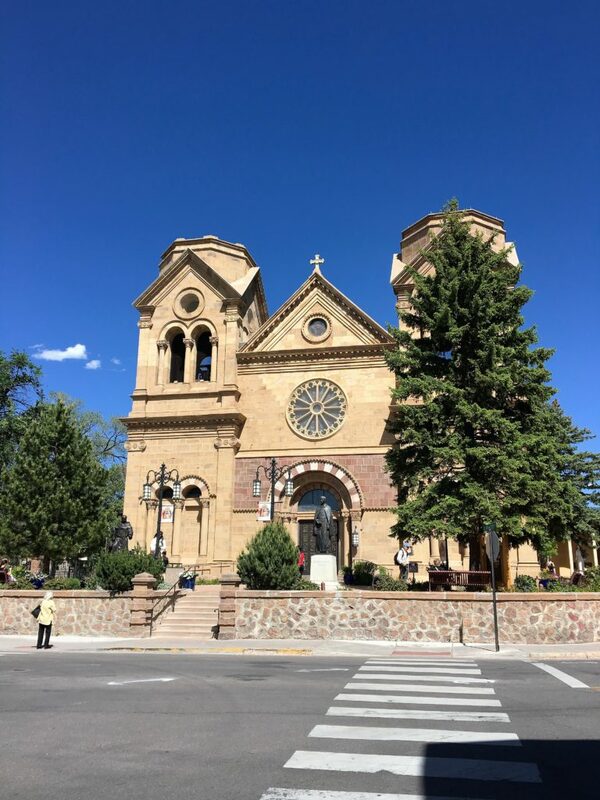 Next door to the Loretto Chapel is the Cathedral Basilica of St. Francis of Assisi . It is magnificent. 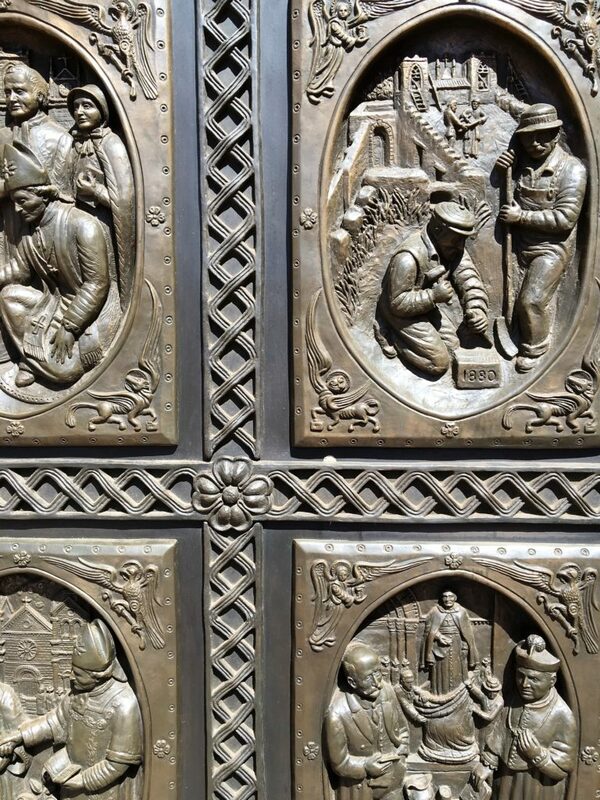 Everything is ornate including the bas-relief metal doors at the front. 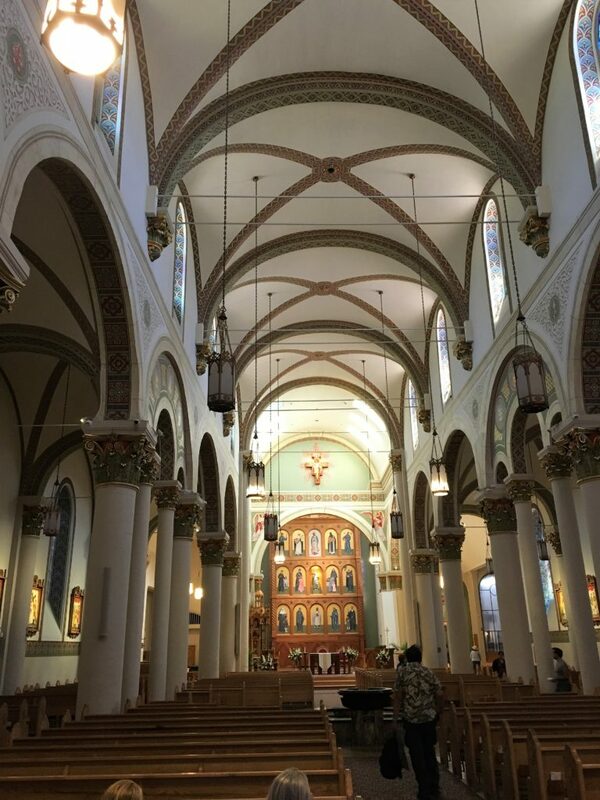 Unlike the San Miguel church which is a national landmark run by the Parks Service and the Loretto Chapel which is a private museum, the Cathedral remains an active Catholic Church. 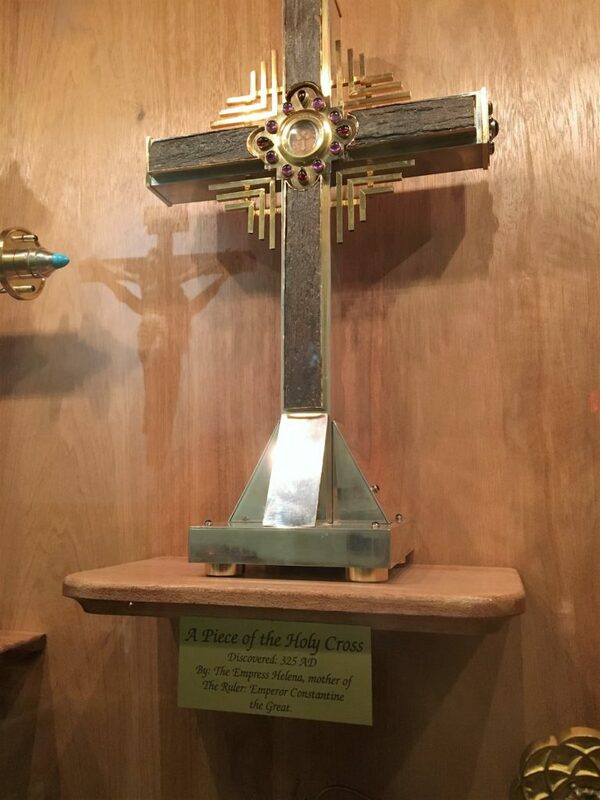 The Cathedral is very impressive and also features a very remarkable reliquary which even claims to have a piece of the Holy Cross! 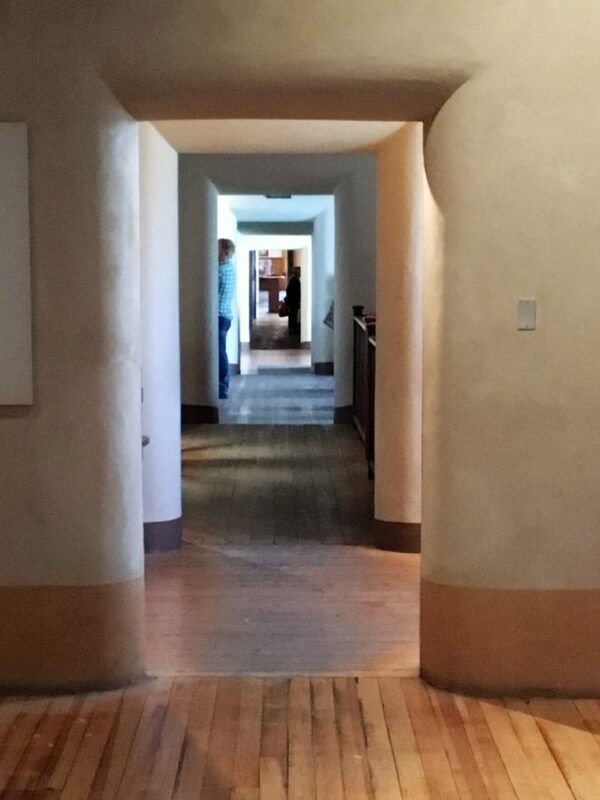 Santa Fe architecture is very distinctive and pleasing. Even more pleasing is the authenticity – this is no Las Vegas casino replica or faux finish style – these buildings are the real thing, dating back hundreds (sometimes 400s) of years. They are not an imitation of anything except themselves. Many of the buildings house art galleries or art museums. 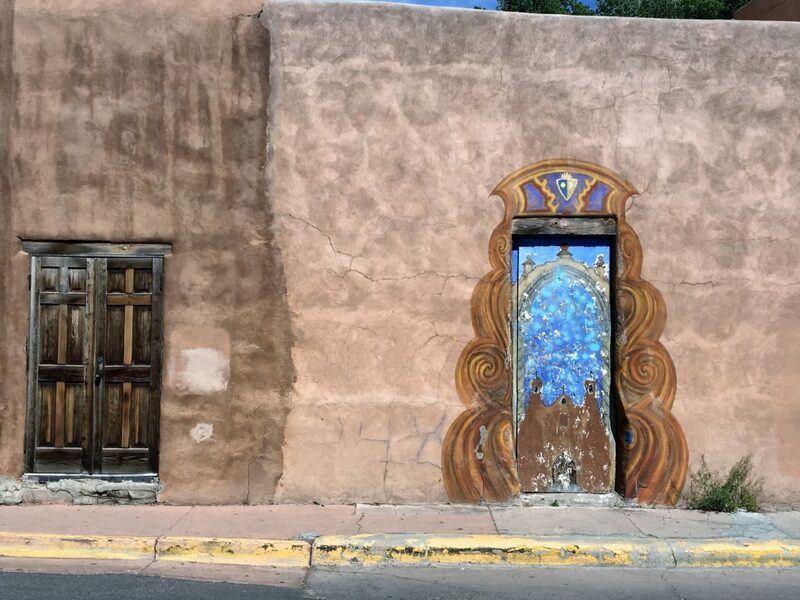 Santa Fe has an abundance of artists of all styles, ability levels, genres, and prices. 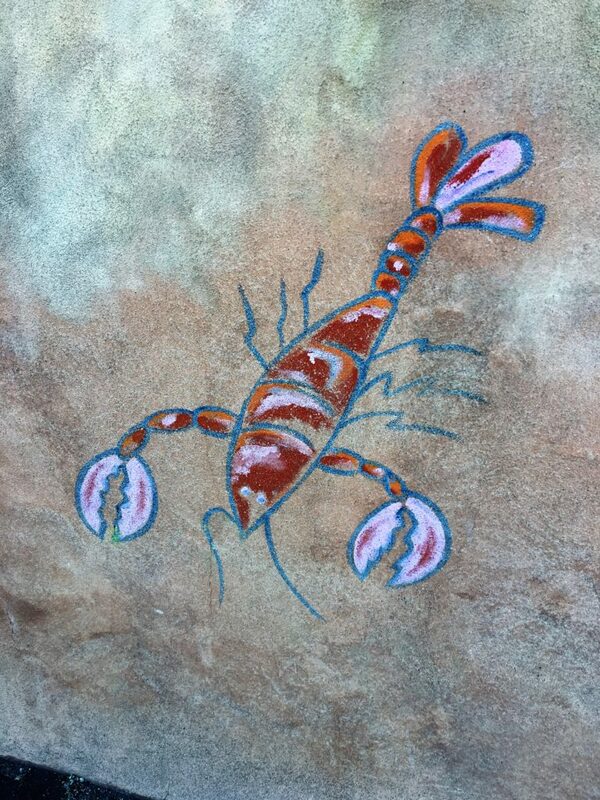 Of course, much of the art is Southwestern in theme, but even in that genre there is a huge range spanning petroglyps to pottery (made to absolutely unbelievable levels of detail), jewelry, paintings, carvings, sculpture, and weaving. This shop – Folk Arts of Poland – seemed a bit out of place but hey, if you are celebrating art in all forms why not? 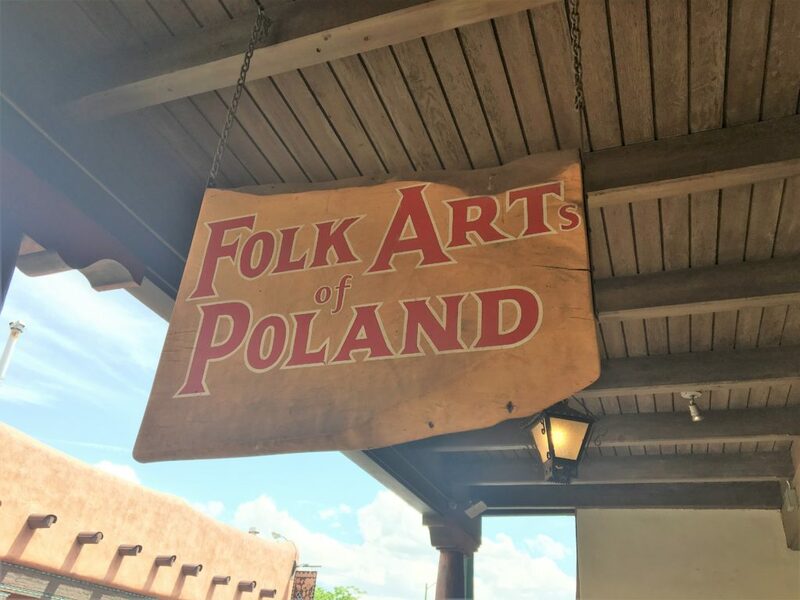 The shop didn’t seem busy though, so I suspect the I-went-to-Santa-Fe-looking-for-Polish-Folk-Art crowd was still at happy hour? Speaking of happy hour, Santa Fe is full of world-class hotels and restuarants. And none is more famous than the La Fonda, one of the Harvey hotels and a true gem. There are several restaurants in the La Fonda including one that features the largest wine cellar for 100 miles in any direction. Don’t think all the food is Mexican. Or more properly NEW Mexican. New Mexican is a lot like Mexican but smothered in green chile. Why the rest of the world does not know about or use green chile is a complete mystery to me. I have yet to encounter a single dish that could not be improved with green chile. Its not particularly hot but has the right amount of heat. It is incredibly flavorful and is slathered on everything. Probably even the lobster. Try it. I guarantee you will love it! I did have some green chile stew at The Shed that was fricken awesome. Hot enough to make me sweat and I loved every minute of it! But there are French restaurants, and Italian restaurants, and lots of “American” restaurants. Not a lot of chain restaurants though, especially in old town (thankfully). We then went to the Governor’s Palace – the oldest continuously occupied public building in the United States. That’s quite a distinction. The building is very old, with long hallways and small rooms. They have left some of the original foundations exposed for viewing. 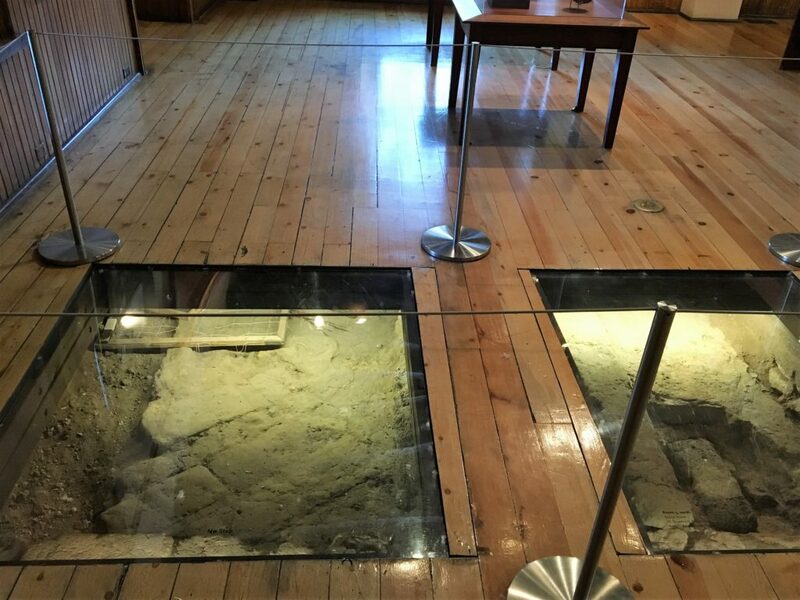 Its possible to see the diagonal adobe floor tiles that would have served as the floor for the Spanish governor himself in the mid 1600s. The Palace is now a museum. The City has build a brand new museum behind the Palace and attached them together. The new museum is really (really) well done. 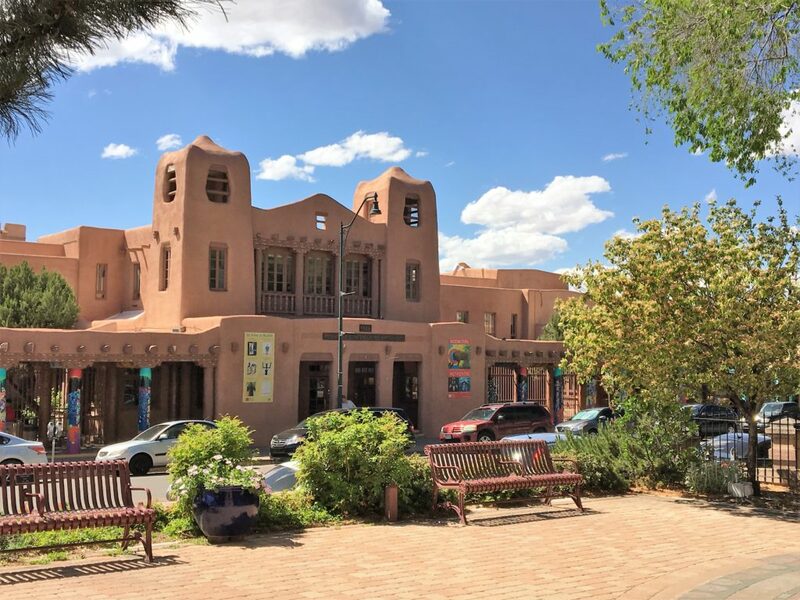 In addition to the history of New Mexico, from the first Indians to the first printing press to the Manhattan Project to the most recent work around the state, the history of New Mexico is presented in a flowing timeline that we walked through. I highly recommend stopping here, and allow 2-3 hours to see it all. 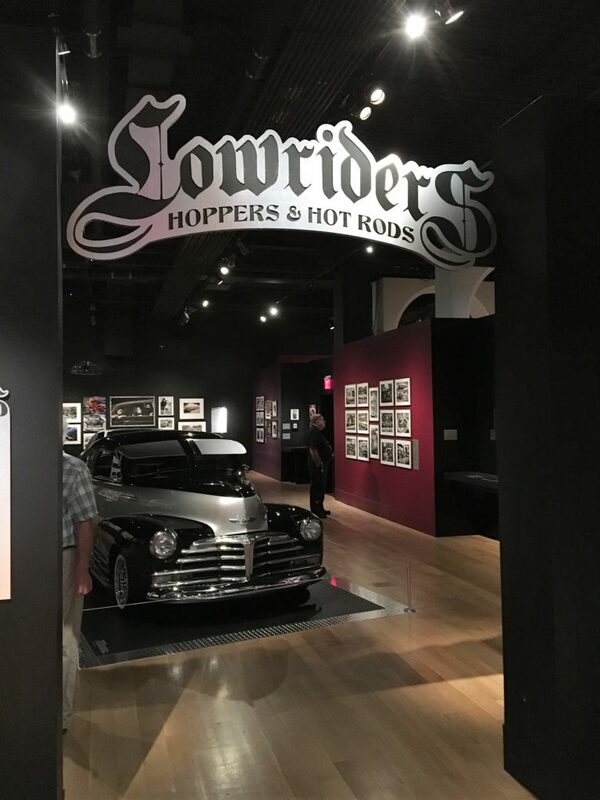 They also have a special exhibit space at the museum and the special exhibit was on low-riders, which originated after WWII when airplane mechanics came back with hydraulics expertise. They were looking to raise their cars over the rough roads of the time but then lower them when they were cruising in the city and a movement was born. For someone who knew almost nothing about the cars or the history of the movement, I left with a new appreciation for it and a much better understanding. 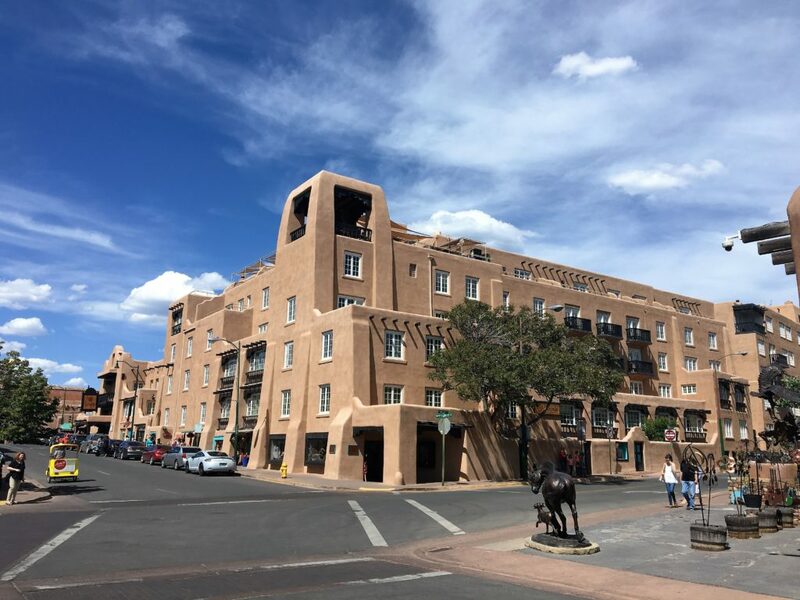 Santa Fe is a very satisfying mix of old and new. Of art and culture. Of food and drink. Please make this a stop on your travel plans someday!